Lined Ball Valves have Body of Ductile Iron as per ASTM A 395Gr-60-40-18 with Ball Stem of ASTM A 351 Gr CF8.Seat Rings are of Pure PTFE. 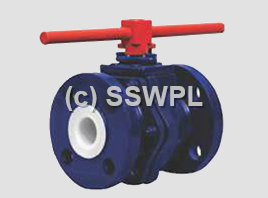 The Valves has many features that make it one of the best lined ball valves, cavity filled seats ensure minimum product hold up. T slots machined in to the cast body ensure the PFA/FEP Lining is secured making it suitable for operation in vacuum conditions. Stainless steel fasteners ensure long term protection from external corrosion. The floating ball offers low turning torques and low pressure positive sealing. The seats, ball, stem and stem packing all easily replaceable on site allowing easy maintenance and overhaul.